I haven’t had a chance to do a book post for a week or two! We have been outdoors so much, making the most of the good weather and I was so busy documenting the fun we were having that I forgot to keep up to date with our books of the week. Back to normal routine Monday as the Easter Holidays finish this weekend 😦 I’ve loved all our little adventures over the past 2 weeks while Doodles was off school. Not to worry, in a few short weeks he’ll be finished preschool forever (aghhhhhh, off to big school in September) and we’ll be off to the South of France for a few weeks (lot’s of adventures on the cards)! 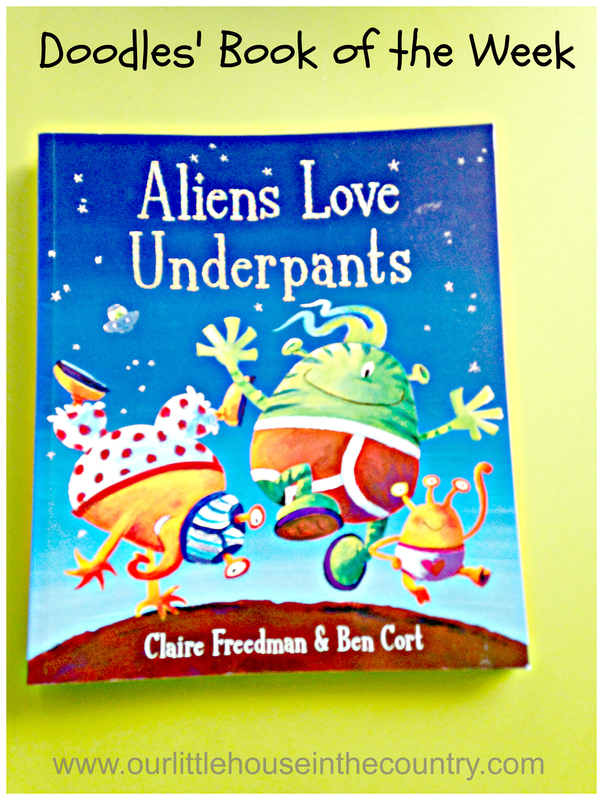 This week’s book of choice is Aliens Love Underpants by Clare Freedman and Ben Cort. D loves this book and the other books in the series. They are so colourful and funny and the perfect way to share some snuggle time before bed, giggling at the antics of these incredibly cute and mischievous aliens! Doodles was first drawn to these books because they were about underpants – hilarious – well hilarious for a 3 or 4 year old anyway! 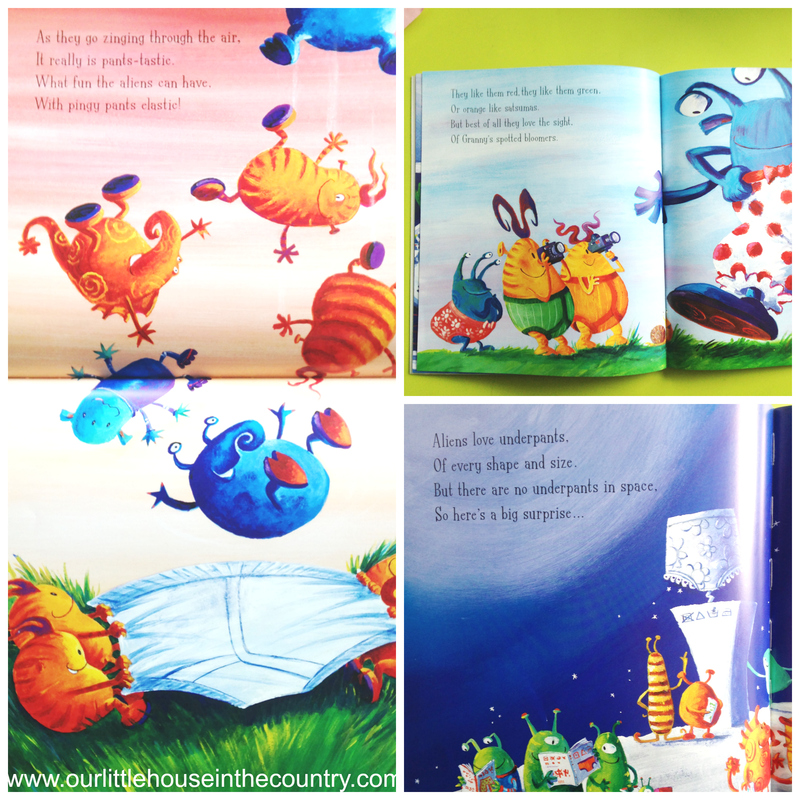 These books are fantastic fun, the illustrations are so inviting, and the rhyming story is a real attention grabber. Why is this a good choice for a 4 year old? Funny story line…aliens and underpants, I can’t think of a funnier combination for a 4 year old boy lol! Tip for choosing books for preschoolers: Choose funny story lines to engage and encourage young readers, especially reluctant readers! I’ve seen it but we don’t have it, will have to get it! Aliens Love Underpants is very funny but our favourite is Aliens Love Panta Claus. Last Christmas we wrapped a pair of pants in each of my daughter’s presents like the aliens do in the story. She thought it was hilarious! That’s a brilliant idea, she must have been thrilled! I’d say we read Panta Claus every night in the run up to Christmas! My son regularly brings them to school for story time! They’re great books- so much fun! We have the board book versions of them too and my 2yo daughter is fascinated by them! Thanks for taking a look and leaving a comment. Hope you are having a lovely weekend.